Todd Solondz is a marmite director. You either love his work or you really despise it. I have a love-hate relationship with his films. He scored big with me with Welcome To The Dollhouse (in which we get to see his main characters return here) and Happiness, which managed to capture the human condition quite brilliantly. He does like to push the boundaries and go out to shock as well as amaze. His other films I have found to be sometimes dull, sometimes contrived and often missing the marks. Now he is back with Wiener-Dog, a four-story tale linked by a dachshund being passed from owner to owner. I have to say we are back in the hate territory for me. A dachshund is first given to a young boy as a friend after recovering from cancer. His houseproud parents refuse to let the dog sleep in the house until he is broken. Yet their plans go astray when the boy feeds him something that certainly disagrees with the animal. It then finds itself in the hands of Dawn, a vet nurse who goes on a road trip with Brandon, the boy she secretly loves. Then a failed scriptwriter teaching at film school takes charge of the dog, finding hatred among his colleagues, his students, and his agent. Finally, an aging woman finds comfort in her last days with the creature. Solondz tries to show us human life in its rawest and it starts off with promise. 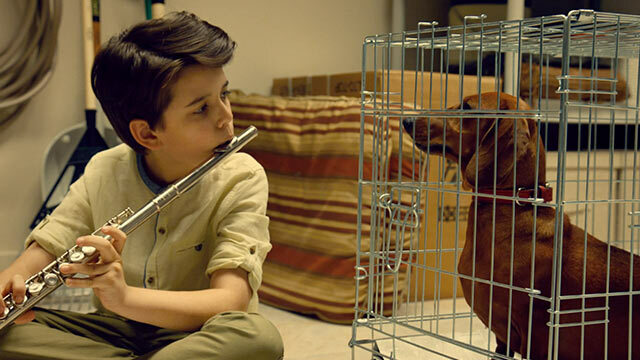 The story of the boy’s new friend does have some genuinely laugh-out-loud moments, including an irate Tracy Letts teaching the dog to heel, while Julie Delpy’s mother has some cringeworthy conversations with her son about mortality and the sexual activities of a dog that do exactly what Solondz does best, make the audience feel anxious and uncomfortable. The second story, which sees the return of Dawn Wiener from Welcome To The Dollhouse, now played by indie cinema queen Greta Gerwin, falls into the “pointless” pile as she jumps on board Kieran Culkin’s road trip to his brother, which doesn’t amount to much. We then get a bizarre intermission (for a film that doesn’t need one) which allows the audience to go purchase popcorn while the dog wanders around various settings. This leads into Danny DeVito’s screenwriter who hates his job, hates his agent as he is constantly pushed from one phone call to another, has a disdain from his students who laugh at his “What if? Then what?” philosophy of writing while they complain about his attitude in class. For me, this is the most successful of the vignettes, as it has a point to prove and ends properly, even if it does move very slowly to its conclusion. Finally, we have Ellen Burstyn’s dying woman, who gets a visit from her niece and her artist boyfriend, desperate for money to pay for his exhibition. This lonely, lost woman, who survives on routine, is the saddest of the stories, yet ends in a most horrific and shocking way that will really test the audience.The performances from all the cast members are good and some of Solondz’s observations about life work well. Yet it feels completely unsatisfying. The laughs are sometimes genuine but often miss their marks, the controversial sequences don’t have the power of that infamous sequence in Happiness, and, to be frank, it’s often boring. This might have worked better if we had a better understanding of each character, yet by having short stories, we don’t really care about them and their plights and the only one we do care about is the dog. Solondz is a unique director not afraid to push the boundaries. I wish here he had gone even further with his shock and awe tactics, Having a long tracking shot of dog poo is not pushing any boundaries. a disappointment.